Model # 96 S Steel w/opt. 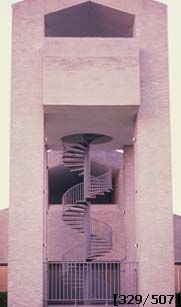 This is a 96" diameter steel stairway for access to an observation tower. This stair is approximately 40’ high utilizing 3/16" checker plate treads with a 22 1/2 degree run. Each tread has four 1" square balusters spaced equally. The landing (not shown) is a 90 degree circular with a 42" high well rail with a 1 1/2" round top rail and 1" square balusters with less than 4" spacing around the opening.